These puzzles are special designs by Kate Jones, based on the logos of various organizations, or created or commissioned for special events. If you're a member of any of these organizations and would like to own that puzzle, order below or inquire about availability where ordering information is not provided. Got a logo or design you'd like to turn into a working puzzle? Inquire. We also show examples of special designs we were commissioned to create as a mental puzzle in art form, not necessarily with moving parts. Click on the thumbnails for full view and description. For The Rodz Consulting Group's corporate website, Kate converted their logo into a puzzle made of polyrhombs sizes 1 through 4 (12 pieces), and each letter and the company's graceful icon contained those exact same pieces. These were made into a swirling Flash animation for the website's introductory page. This logo is trademarked and the puzzle graphic is copyrighted by The Rodz Group, leaders in pricing strategies for enterprise software and high-tech services. Their website was later redesigned to a more traditional style and the logo puzzle retired. It was fun while it lasted. Since 2011 a new website is under construction. The polyrhombs returned to their birthright as purely a puzzle for the 2006 International Puzzle Party in Boston, the Boston T-Party. The Mensa logo puzzle, designed for Mensa's 50th anniversary in 1996, has 16 pieces that can also form the number 50 and other Mensa-related letters. It is about 9x9", lasercut acrylic. Available only to Mensa members for $49. Click on picture to visit the ordering page. Kate proposed this replica of the special logo Mensa used for their 60th anniversary, celebrated in Orlando, Florida, in July 2006. However, the bureaucratic process curtailed actualization. It would have been nice, though, in clear Lucite to look like a diamond. There were to be a pairone with clear pieces, the other with clear background. Some things just are not meant to be. For the 50th Anniversary of SIAM (Society for Industrial and Applied Mathematics) in 2002, Kate turned their logo into a two-fold puzzle with 70 uniquely filigreed square tiles. Each tile is a different combination of any of four kinds of edge: tall or wide triangle (proportioned by the golden ratio), circle, or blank. These are to match where edges meet, like dominoes. They exactly fill the SIAM name in the upper half, and the challenge then is to fill the space occupied by the gold numerals, all beautifully matched. Lasercut acrylic in SIAM's colors, about 14x20". Inquire about availability. $75. This red-white-and-blue puzzle was designed for the International Puzzle Party's 22nd anniversary and puzzle design competition, held in Antwerpen, Belgium, August 2002. The 16 pieces forming the IPP are to be rearranged to fill the 22. It stumped all the puzzlers at the party. Lasercut acrylic, 11x11". Sold out. The blue and purple edition was designed for the 23rd International Puzzle Party in Chicago, 2003. Sold out. For the Silver Anniversary of the Maryland Renaissance Festival in 2001, Kate designed a special version of Kadon's Poly-5 puzzle with the numerals 25 embedded in silver acrylic. This actually makes an excellent gift for any other 25th anniversary celebrations, as well. Lasercut acrylic, about 7x7", available in this special style for $49, instruction book included. Just click on the picture to inquire about ordering. Color of the pieces may vary. Tell us your preference, and whether to personalize it. For Kadon's 30th Anniversary celebrated in 2009-2010, Kate designed a special reversible version of Kadon's Poly-5 puzzle: one side with the standard Poly-5 tray, the other with the numerals 30 embedded in pearlized orange to match the frame. The pieces are transparent Lucite colors. This actually makes an excellent gift for any other 30th anniversary celebrations (pearl is traditional for 30). Lasercut acrylic, about 7x7", available in this special style for $49, instruction book included. Just click on the picture to inquire about ordering. We can try to match your preferred color and personalize it. 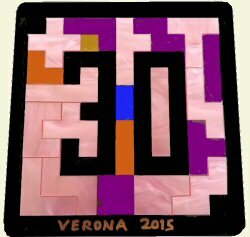 For Rose Squared Production's 30th Annual Verona Fine Art and Crafts Festival in 2015, we embedded the number 30 into a special edition of Poly-5, with a majority of pearlized pink pieces to match their name, Rose. This set makes an excellent gift for any other 30th anniversary celebrations (pearl is traditional for 30). Lasercut acrylic, about 7x7", available in this special style for $49, instruction book and two game grids included. Just click on the picture for more of the story and to inquire about ordering. We can try to match your preferred colors and personalize it. For Kadon's 35th Anniversary celebrated in 2014-2015, Kate designed a special version of Kadon's Poly-5 puzzle with the numerals 35 embedded in marbleized green (to simulate jade) to match the frame. The pieces are transparent Lucite colors. This makes an excellent gift for any other 35th anniversary celebrations (jade is traditional for 35). Lasercut acrylic, about 7x7", available in this special style for $49, instruction book and game grids included. Just click on the picture to inquire about ordering. We can try to match your preferred color and personalize it. For the 40th Anniversary of the Syracuse Arts and Crafts Festival in Syracuse, NY, in 2010, Kate designed a special version of Kadon's Poly-5 puzzle with the numerals 40 embedded in pearlized acrylic among transparent puzzle pieces, in a special frame. Click on picture for full story. This set makes an excellent gift for any other 40th anniversary celebrations as well. Lasercut acrylic, about 7x7", available in this special double-framed style for $49, instruction book included. Email us to inquire about ordering. A personalized caption can be engraved into the frame, and you can choose your preferred colors. For the 40th Anniversary of Gilmore Enterprises' award-winning Greensboro Craftsmen's Christmas Classic Crafts Festival in 2013, Kate made this special version of Kadon's Poly-5 puzzle with the numerals 40 embedded in metallic blue acrylic among transparent puzzle pieces, in a special frame. Click on picture for full story. This set makes an excellent gift for any other 40th anniversary celebrations of your own as well. Lasercut acrylic, about 7x7", available in this special style for $49, instruction book and display stand included. Email us to inquire about ordering. A personalized caption can be engraved into the frame, and you can choose your preferred colors. For the Golden Anniversary of the Three Rivers Arts Festival in Pittsburgh, PA, in 2009, Kate designed this special version of Kadon's Poly-5 puzzle with the numerals 50 embedded in gold acrylic among transparent puzzle pieces. This set makes an excellent gift for any other 50th anniversary celebrations as well. Lasercut acrylic, about 7x7", available in this special style with two-sided tray for $55, instruction book included. Just click on the picture for more of its story and to inquire about ordering. A personalized caption can be engraved into the frame, and you can choose your preferred color. 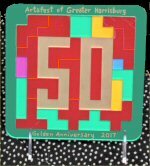 For the Golden Anniversary of the Artsfest of Greater Harrisburg in Harrisburg, PA, in 2017, Kate designed a new special version of Kadon's Poly-5 puzzle with the numerals 50 embedded in gold acrylic among transparent puzzle pieces. This set makes an excellent gift for any other 50th anniversary celebrations as well. Lasercut acrylic, about 7x7", available in this special style for $49, instruction book and two game grids included. Just click on the picture for the rest of its story and to inquire about ordering. A personalized caption can be inscribed on the frame, and you can choose your preferred colors. This is our own 20th anniversary commemorative puzzle  the famous W logo divided into 20 pieces, with 20 challenges and 20 figures to solve, and a small suction tool to help lift the tiny pieces. Lasercut acrylic, packaged in a CD jewel case. This was a limited edition, each set numbered, discontinued October 2004. We've archived a complete copy of its illustrated booklet. Kadon was commissioned in 2004 to design and produce a puzzle that would match the corporate logo of goetzpartners and would provide ever-different variations of design. Goetzpartners was formed in 2004 by the combination of CEA (Communications Equity Associates)  the corporate finance advisory  and TransConnect Group  the management consultancy. The combined company is a top-tier corporate advisory firm bringing together corporate finance and management consulting expertise to reflect the shift from traditional specialisation in these fields to integrated services. goetzpartners takes a single approach to both disciplines  the expert delivery of outstanding results based on innovative thinking. Goetzpartners' logo is a significant while elegantly simple structure, formed by two rhombic shapes only. The two shapes symbolize the two services offered by goetzpartners and the two firms goetzpartners is formed of. The two rhombs are used as an overall pattern throughout the goetzpartners corporate design as well, including their elegant website. Clyde Gilmore runs one of the best craft show organizations in the country, 38 years strong as of 2012, for his oldest show that his father had founded in Greensboro, NC. He has venerable shows in Richmond and several other strong venues. New shows have been added in recent years as the success of the organization grew. Gilmore Enterprises has a fine website and can also be reached by email. Clyde has a great team of people overseeing every aspect of staging successful shows. Kate is a frequent exhibitor in these shows and appreciates the attention to every detail that makes a show click and that takes special consideration of the needs of the artists. The little toy soldier appears on all their literature and at one time stood as a 50-foot-high balloon figure on guard at the entrance of the fairgrounds in Richmond, making it visible from afar that the Christmas Classic was in town. For the Richmond show's 2004 anniversary, Kate designed the little toy soldier into a working puzzle and presented three of them to Clyde as a token of appreciation for the many years of beneficial collaboration. The laser-cut acrylic set was about 7" across, in a mix of four colors, with additional handpainted trim. This was our 25th anniversary puzzle  the W logo divided into 25 all differently colored "P" pentominoes in transparent acrylic, with 25 challenges and 25 figures to solve, and a small suction tool to help lift the small pieces. Lasercut and engraved silver/black reversible acrylic 5" tray has the figure 25 on the back. This numbered edition was limited to 125 sets. Here is a complete copy of its illustrated booklet. Discontinued October 2007. This double-entendre alphabet was commissioned by movie producer �ric Angelini of Belgium. A patron of the arts as well as an artist himself, and with an avid interest in alphabet styles (reportedly he even has an alphabet tattoo), �ric was looking for something unique  the French phrase, Vingt-six lettres de l'alphabet, means literally: "The twenty-six letters of the alphabet." And it contains exactly 26 characters! The assignment �ric set us was to have the French statement contain exactly every letter of the alphabet once. With some letters duplicated and some letters missing, the existing letters would have to do double duty by being morphed to look like two letters at once. There is even a name for such designs: ambigrams. Having established that Mr. Angelini is a bon vivant, a brilliant wit and a Renaissance man, we took up the challenge. Vingt might mean twenty in French, but more people know that vin is French for wine. Ah, tr�s bon! Growing dainty green vines over sturdy logs would enable the dual shapes and provide the fine glass of wine at the end. After sketching the design and inking in the vines, Kate asked an associate, Thomas Atkinson, to ink in the logs. Thomas found it easier to work electronically, and a nice .jpg file was the result. �ric was most pleased with the electronic file he received, and then asked for the original paper copy. Oh my. Pencil sketches on graph paper is all there was. �ric graciously declared that such natural art was even more interesting, and having some sketches on the back of the sheet from a previous creative effort only made it better yet. Kate and Thomas polished up the paper drawing which, because of its size, also had to be taped together from two pieces. Interestingly, the puzzle on the back was the first version, the moment of genesis, of what eventually became Kate's Word Pingpong. In Word Pingpong you simply bounce back and forth between two words, picking up one letter at a time to form words. �ric was delighted with it, especially because Kate added a second word pair, �RIC and KATE, and a few of their joint words. "Trace" was a nice word to find, and so was "Racer". So �ric got double double for his trouble. A team-building training facility ordered 3 giant motivational puzzles, each 36" square with a 6x6 pattern of 6" tiles with embedded lettering in a fine wood frame. Above are the 3 messages, with an example of how they might have looked scrambled and awaiting the team of players whose task it would be to collaborate in the solving. Our major puzzle to solve was how to package and ship them! They were huge! Bill Rupp of Grace Covenant Presbyterian Church in Asheville, North Carolina, needed a puzzle shape that would interlock, but not be a complicated puzzle, and that could be written on and mailed in an envelope, as a fundraiser memento for his church's pledge drive. Our solution was the tabbed hexagons shown, in 5 colors, lasercut in foam posterboard, quarter-inch thick. Lightweight but sturdy, the 3.5-inch wide pieces hold together well and fit together every way. Bill sent us this photo of the growing assembly of over 200 pieces. When Sherry Kelm, who lives just five doors down from us though we'd never met, phoned in January 2013 to ask for help creating a logo puzzle for her client, the Bon Secours Health System, on a very short deadline, we jumped right in. Sherry supplied an excellent image and specifications, and within hours we had finalized just the right design. In a few days the finished product, an 18" acrylic puzzle/plaque, was in a delighted Sherry's hands. By then Kate had left for Florida, and the work was finished by the heroic home team of Thomas Atkinson and Josiane Smith. The concept we came up with for this puzzle is such a cool idea, we may just use some form of it in one of our own future puzzles. Thanks, Sherry, for the opportunity to dream this up. We hear the client was happy with it, too. They'll be able to make good use of it for years to come. Walmart (the latest spelling of Wal-Mart and Wal*Mart) is the world's largest retailer, with tens of thousands of associates, who take pride in how they assist the millions of customers. Walmart with its enlightened management approach (a legacy of founder Sam Walton) is deservedly successful for supplying the widest range of products that consumers want and need, at the lowest prices. 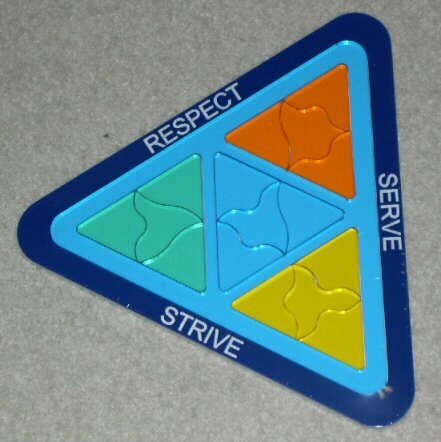 Their three core values are to respect, to serve and to strive. When Walmart's training manager needed a hands-on tool for their training workshops, he found us. We proposed this rework of their design for a cooperative problem-solving and team-building experience. Walmart's inscriptions of their core values serve as a border. Below the pieces, the floor of the tray is engraved with other key concepts. After a bit of tweaking, we were commissioned to produce a quantity of the puzzles, followed by another batch in French. This was one of our most gratifying custom projects. The photo shows all four triangles filled with a single color. The puzzle can, however, be assembled so that each triangle contains 4 different colors. Too cool. 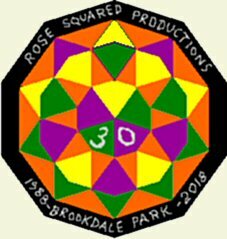 For Rose Squared Production's 30th Annual Brookdale Park Fine Art and Crafts Festival in 2018, we presented them with a special edition of Kite-Mosaik, with the pieces arranged like flower petals to match their name, Rose. Lasercut acrylic, about 7x7", with instruction booklet. Just click on the picture for more of the story. 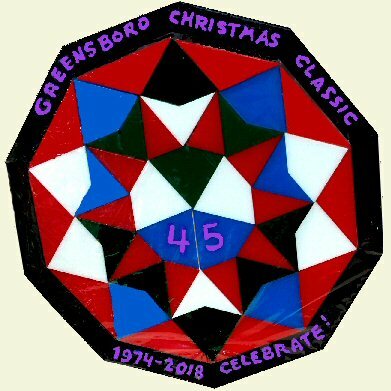 For Gilmore Enterprises' 45th Annual Greensboro Christmas Classic Crafts Festival in 2018, we presented them with a special edition of our 45-piece Kite-Mosaik set, inscribed for the occasion. Lasercut acrylic, about 7x7", with instruction booklet. Just click on the picture for more of the story.